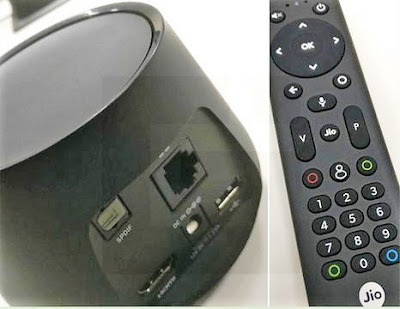 Jio Dth launch date is coming, leaked image shows Reliance Jio set-top box with round case. Reliance Jio is working for the launch of its JIO DTH service in India and the leaked images of Jio STB (decoder) by Gizmo times confirmed reports that the launch date of Jio DTH service is nearer. It was quite a buzz on the internet about Jio Dth. Some say Jio is going to launch its direct to home TV service but some had other views. But after the leaked images of Jio set-top-boxes it is confirmed that jio is planing to rule TV distribution industry too. But it is still not confirmed whether jio is planing a DTH service or an IPTV service via its fast broadband Jio fiber in India. The leaked image shows a round-top box that is supposedly connected to Jio fiber or a dish. The picture also shows a button of the remote control having a microphone which shows the presence of features of voice control. Unlike other STB devices offered by competitors, the STB of Jio is round in shape and might be the first of its kind. For connectivity options Jio STB has an S/PDIF (Sony/Philips digital interface format), an Ethernet port, an HDMI port and a USB port," said Gizmo Times. Jio's logo on the remote indicates that the service is in the final test phase and will be launched shortly. The Jio Dth service accorging to rumers is expected be launched in March or April 2017. Reliance Jio would have begun to deploy Fiber to the Home Services (FTTH) in Mumbai in mid-January. A report from India today said, there are few buildings in Mumbai where people can subscribe to the service after the completion of the cable installation for Jio Fiber, which began in November the last year. As Jio Reliance plans to build its digital ecosystem via mobile services and now with its Jio Dth service. Jio is already offering live internet TV via an app called Jio TV.